Ivie M. Eke is a Writer who daydreams about constant electricity in Nigeria and mangoes. 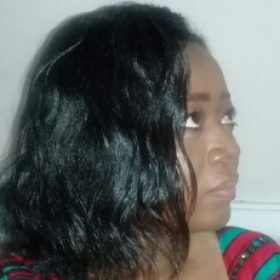 She writes poetry, stories and essays on her blog, www.classicallyivy.com and is the author of three books: ‘Looking for myself and my phone charger’, ‘Walking On Eggshells’ and 'Dirt In The Dust', all available on Okada Books and Amazon. Emotan did not like her Father very much.  Thanks for the accolades! There’s no continuation; that’s where the story ends. Now there’s a twist  Great job, Cavey! You’re welcome -and thank you! ‘Mean writer’  Thanks a lot-I really appreciate your support! ‘I will leave this man when we return from visiting his family’.